I’d rather feel SORE tomorrow, than SORRY tomorrow. This really hit home for me. 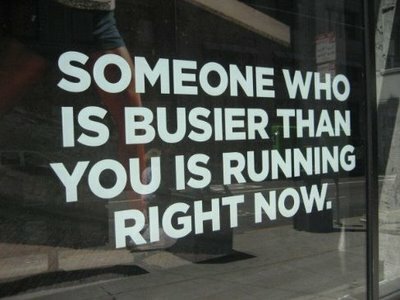 So often we set exercise and fitness at the bottom of our priorities because we are….too busy. I am really good when I have some sort of organized class/group workout, but on my own…not so much. I am very committed to my boxing training on Monday, Wednesday, Friday and Saturday. As well as my cross fit on Saturday mornings, but I have recently been coming up with excuses to not be training on my off days. My New Years resolution this year is going to be fitness based. I want to wake up early every morning and ideally train twice a day. My goal is to reach a new level of physical fitness. It will not be easy at first, but once I mentally overcome the initial fatigue in the first few weeks, I am positive that the rewards and results will be worth all the sweat and tears! Quote of the day: I’d rather feel SORE tomorrow, than SORRY tomorrow. Great things are coming in 2012. What are your fitness Goals? Live, Love, Laugh and Play! This entry was posted in Boxing, Exercise/Fitness, Life by In Ev's Corner. Bookmark the permalink.